Healthy Communities is significant in that it piloted a method combining C4D, non-formal learning and participatory media called the Community Learning Programme (CLP). Initially used in Isabel with a public health theme, the method could be used in many other thematic areas especially where discovery-led and community-driven learning for development is important. The CLP uses a tool called the message matrix where actions are mapped to their benefits and consequences, creating a matrix of key messages to be used in creative audio (or other) media production, such as the plot for drama series. We facilitated participatory planning and design workshops and provided digital media training. Four villages produced and broadcast (to great interest) series of digital radio programmes about their priority health issues such as diabetes, healthy village environment and teenage pregnancy. Production was based on low cost, commonly available tools (in those days, netbooks with mp3 recorders and Audacity software). The design workshops came up with entertaining formats including school quiz, jingles, choral singing, serial drama and debates, all featuring local voices only (with invited guests). The project was not involved in running or managing the radio stations, only in the co-production of these participatory media resources. We had no involvement or influence over the sustainability of the radio stations, other than giving advice when the occiasion arose and via a high-level advocacy workshop held in Buala in 2012. I have archived some of the mp3 radio programmes on this page. Na Au Fa Keli Episide 4 entitled “What makes rubbish?” from Susubona is a good one!!! The CLP programme guides developed in the workshops are available at the link below. Following the Healthy Communities first phase programme, a second phase developed a monitoring and evaluation framework for the CLP, and in parttership with the University of the West Indies and CARIMAC, a CLP Developer Certificate open study programme is now available. 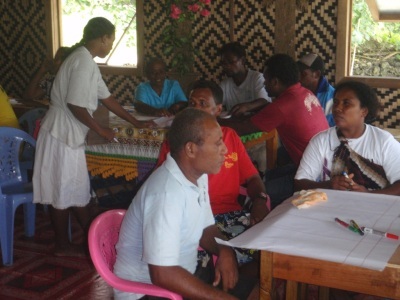 I hope the CLP method can be used more widely in the Solomons and the Pacific Islands! 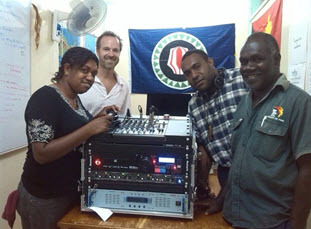 Looking back at the radio programmes produced under the Healthy Communities project in Isabel Province, Solomon Islands, 2009-2012. This project was a partnership of four communities with Isabel Province and Health Services, Ministry of Health and Medical Services Health Promotion Division, Solomon Islands Development Trust, People First Network, Leeming Consulting and Commonwealth of Learning. 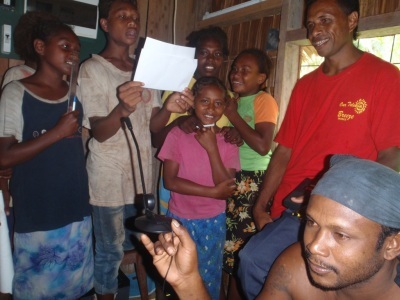 Several communities in Isabel Province, worked together to design and produce educational radio programmes for their local FM stations (community FM radio). They used a participatory and blended approach called the Community Learning Programme (CLP). This initiative was started with assistance from the Commonwealth of Learning’s Healthy Communities programme, which ran from 2009-2012. The programmes were recorded with simple digital equipment such as hand held mp3 recorders, and mixed and edited using Audacity on low cost netbooks, without any need for “experts”. This series is about a healthy village environment. This series is about healthy lifestyle, featuring diabetes prevention. This series is about healthy marine and river environment. This programme was produced by Sigana and Tababa FM and Isabel Youth members as part of the Learning4Peace project. A student essay written about the use of Twitter by activists campaigning for West Papuan independence. It is well known that community media can be an effective platform for collective action regarding social change. The locally interpreted issues explored in community media can build solidarity regarding solutions. These days, more often than not, social media plays an important role in those solutions and campaigns. Social media has changed the game as digitally networked action promotes different ways people are coordinating actions. This article which I wrote as part of a group exercise in some studies I am pursuing describes the new logics of connective action. The Australian film Tanna, co-directed by Dean and Martin Butler and made in collaboration with the Yakel people of Tanna, Vanuatu, has won two major prizes at the Venice Film Festival, writes Peter Bradshaw in The Guardian. Hearing about the film led me to reflect on a critical analysis of an other film in the same genre, Hereniko’s Rotuman film The Land Has Eyes, that I had conducted earlier this year, and to make connections with new media and activism. 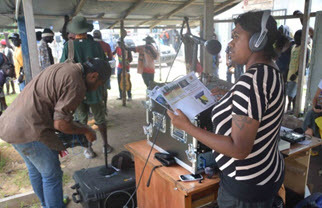 The Bureau Media and Communications Department of the Autonomous Bougainville Government launched recently a mobile radio broadcasting service in Buka, its capital. 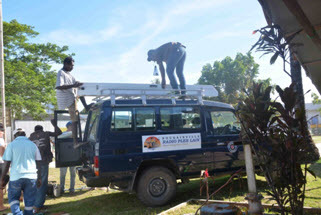 This service will travel around the Island of Bougainville informing the people about the planned referendum, voting and other important topics. The Autonomous Region of Bougainville, previously known as the North Solomons Province, is an autonomous region in Papua New Guinea. The largest island is Bougainville Island (also the largest of the Solomon Islands archipelago), and the province also includes Buka Island and assorted outlying islands including the Carteret Islands. The capital is temporarily Buka, though it is expected that Arawa will once again become the provincial capital. The population of the province is 249,358 (courtesy Wikipedia). Leading from the peace agreement which embedded the right to hold a referendum on independence not earlier that 2015 and no later than 2020, the ABG is planning to inform and educate the people of Bougainville the importance and the voting process of the referendum. One of the methods adopted is to travel to rural areas with the mobile radio station and broadcast locally. 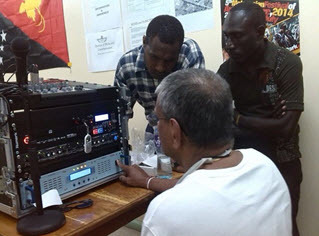 For this purpose the Media Unit of ABG purchased a Radio-in-a-Box (model Proteus), a portable radio station, from the Australian company, In a Box Innovations. A vehicle mounted telescopic mast was also purchased to facilitate portable use of the radio station. The equipment was delivered in September 2014. A training programme for the operational staff was held early October to ensure that the staff are conversant with the setting up and operational processes. 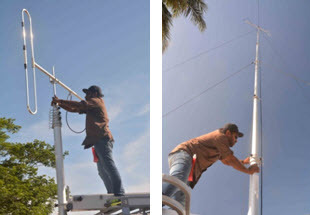 As the portable telescopic mast had not arrived at the time of the training, the installation procedure was explained to the staff. A temporary mast was erected using a galvanised pipe to test all the equipment and to make several test broadcasts. The portable telescopic mast has now been successfully installed on a Toyota Land Cruiser and the mobile radio station is now operational. 2000 windup radios were also purchased for distribution to people who do not have access to radios. This project was jointly funded by Department of Foreign Affairs and Trade, Australia and New Zealand Aid Programme. 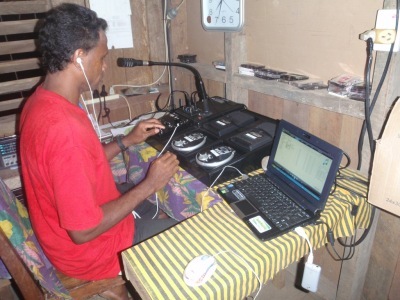 The Community Media Forum is an idea for a local partners network, to support community media development in Solomon Islands (and regional friends). There is no organisation taking a lead role, and anyone with a genuine interest in community media development in the Solomon Islands (but not exclusively) is welcome to join. As of date (mid 2014) this forum is not active; however please contact (see contacts page) if you are interested in collaborating on such an initiative in (or related to) Solomon Islands.